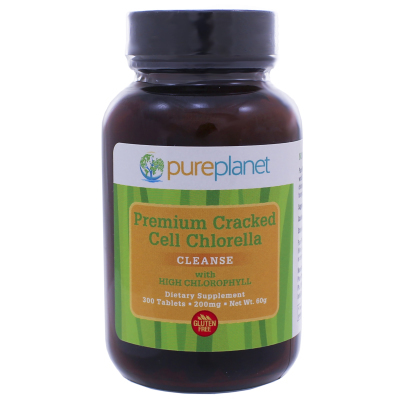 Pure Planet’s Cracked Cell Chlorella fresh water algae is cultivated in a controlled pond-like environment, filled with mineral-rich water. No ocean derived waters are ever used . Rich in amino acids, beta carotene, B-Vitamins, chlorophyll, key minerals and protein (50%), chlorella supports healthy cell development with Chlorella Growth Factor (CGF) . Known for its fat-burning prop- erties, Pure Planet’s easily-digestible, cracked-cell wall chlorella is an essential to any cleansing regimen and may help prevent heavy metal build-up in soft tissues and organs of the body . Available in tablets or powder, we suggest using chlorella daily, as needed, or in conjunction with a cleanse or our Organic Parasite Cleanse .